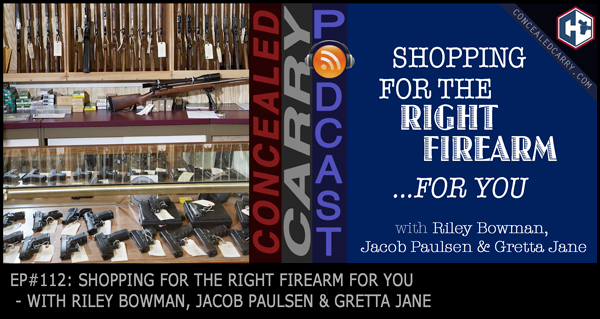 Last week we talked about selecting the right firearm, so it seemed only natural to talk this week about how to shop for and buy the right firearm for you. What resources are available? Where can the best deals be found? What to look out for and what to avoid are all topics we cover in this episode today. Listen in now! Sports Afield. Now available at their lowest price ever on ConcealedCarry.com, Sports Afield brings you a series of handgun vaults that will beat any competitor in price and quality. In addition you can now find select full size safes on from Sports Afield on ConcealedCarry.com. The shipping is reasonable and the warranty is second to none. All full size safes have a lifetime warranty that even covers the paint. Trust this 100 yr old American brand with your firearm storage.www.concealedcarry.com/sportsafield and for a limited time save 10% with a special coupon code, but you gotta listen to the episode to get it! MantisX. Being called “the instructor in your pocket” MantisX attaches to your firearm and sends real time data back to your mobile phone that will guide you in correcting the most common deficiencies as a shooter. Tired or that grouping being to high or too far to the left? MantisX will be your new best friend. Watch Riley and Jacob’s review and learn more atwww.concealedcarry.com/mantisx and for a limited time save 10% with a special coupon code, but you gotta listen to the episode to get it! I don’t know who wrote the review and mentioned the “awkward giggle/laugh”, but I’ve noticed the same thing. I don’t think it’s actually the laugh though–it’s the timing. I only notice it when the guest is phoning in to the podcast. Sometimes there’s a noticeable lag, and then the laugh comes late so it feels awkward and a little off. Like watching tv with the audio and video out of sync. Not a big deal, but, figured I’d give you my best guess at what the reviewer was talking about. And it’s true–it does wear on the listener. It’s much more enjoyable (in any podcast I listen to, not just yours) when the people conversing are actually together and not doing it through an online connection. All that said, I’d rather have an episode of your podcast, lags included, than not have it at all. So if that’s the only way to make it work for the episode I’m alright with it. Thanks guys (and gal!) for the show. I listen to every one.